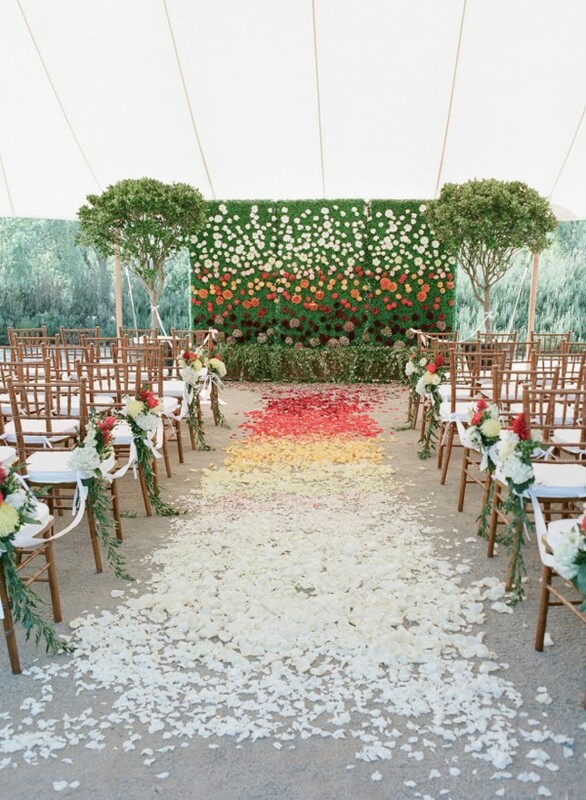 Flower wedding arbors are a naturally romantic way to add to a ceremony space. Not only does it help to frame the couple during the special moment but since there are so many different styles and colors to choose from, it can help lift the theme of any wedding. This beachside ceremony is beautified with a flower arbor resting right in the sand. The pink and red roses add astounding color while sprays of assorted white flowers and greenery balance out the design. Romance can be created with modest hues of white and blush. With a heaping assortment of roses set on a bed of greenery, this rounded arbor is made even lovelier with swags of satin ribbon. The couple stuck to a colorful collection of roses for this arbor. However, they are nestled in a frame of greenery and wispy willow for a natural and organic feel. Fashioned around a wrought iron frame, silver dollar eucalyptus looks rustic and romantic next to blush and cream roses. All white orchids hang down from this contemporary design. Bare trees are housed in simple white planters and are intertwined at the top to create the ideal frame. A bold color is the perfect choice for a vineyard wedding. This square-designed arbor adds a welcome dose of color with its pink flowers and greenery. An arbor can also be crafted with thick, sturdy branches. 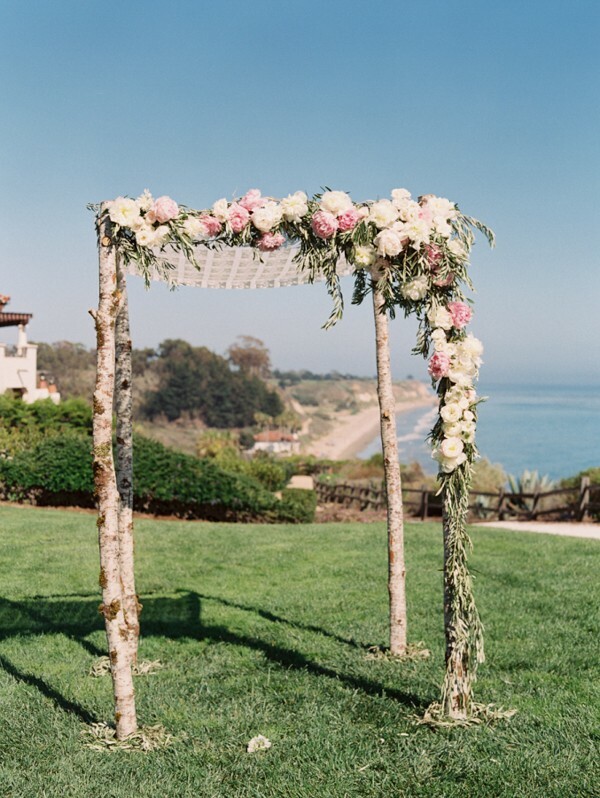 This chuppah is made from four posts and a panel of fabric, all adorned with a collection of pink and white peonies and roses. This arbor is glorious in color and texture. Large swags of greenery with dots of orange roses hang down from the top. Four posts are decorated and anchored with spiraling arrangements of greenery and colorful florals, as well. The delphinium is tall and stunning, and the orange dahlias are lively. A flower arbor doesn’t have to be completely covered in blooms. This style reinvents the notion with a fabric-covered frame and hanging carnations. Each post is sweetly decorated with an arrangement to tie back the fabric. This is also a unique twist on the flower arbor idea. A white mantle is covered with a large swag of greenery. Atop the piece is a frame filled with all kinds of white and blush flowers that adds a subtle touch of color to the white wall. For a garden party theme, this three-piece hedge is an ingenious idea. An ombre flower display is created with white, pink, orange, and red flowers. At its base is a dripping of greenery that leads to an ombre aisle, as well. Flower arbors have come a long way and there are many shapes and style from which to choose. Take stock of the location and the colors of your wedding to create your very own ceremony statement.